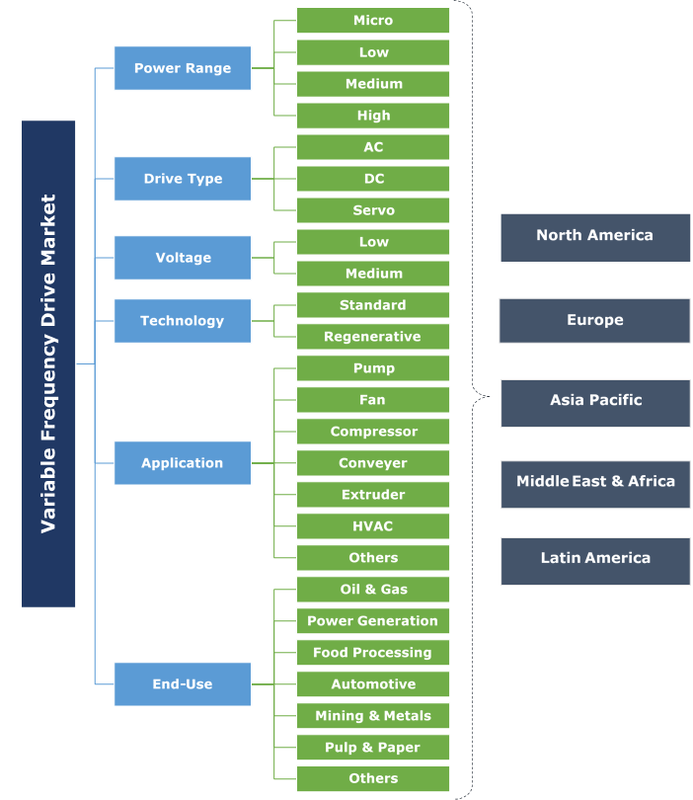 Global Variable Frequency Drive Market size was valued at over USD 17 billion in 2016 and the annual installation is set to exceed 34 million units by 2024. Introduction of standards and directives toward energy efficiency coupled with rising adoption of renewable energy systems will drive the variable frequency drive market size. In 2014, the U.S. Department of Energy has introduced standards for energy efficiency under which all HVAC systems deployed on or after January 2015 should follow Seasonal Energy Efficiency Ratio standards. Rapid industrialization and urbanization along with increasing investments toward infrastructure development across emerging economies will foster the variable speed drive market growth. Shifting focus toward the optimum energy utilization along with the adoption of energy efficient products to ensure energy security will complement the business outlook. Micro variable frequency drive market size is set to exceed USD 4 billion by 2024. Technological advancement across construction equipment including electric motors and pumps will augment the industry growth. In 2016, the global infrastructure spending surpassed USD 79 trillion across all major industries including energy, telecommunication, transport and water. High power variable frequency drive market will witness strong growth owing to the adoption of high-end technologies to meet the government standards. Introduction of codes and standards to establish green buildings will positively impact the business growth. AC variable speed drive market is set to witness gain over 3% owing to rising electricity demand led by Asia Pacific and Middle East. High efficiency and limited maintenance are some of the key parameters that will encourage the product adoption. DC variable frequency drive market will grow owing to its wide applicability across cement and chemical industries. Positive outlook towards manufacturing facilities along with robust expansion across automotive industry will complement the business landscape. 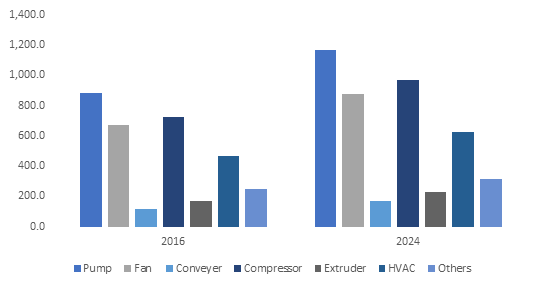 Low voltage variable frequency drive market is projected to witness gain over 3% by 2024. Initiatives toward energy conservation along with retrofit activities across residential, commercial and industrial establishments will augment the industry growth. High acceptance across major industries including metals & mining, petrochemicals, utilities and cement industry and compact design will further propel the product demand. Medium voltage variable speed drive market will witness robust growth on account of the expansion of existing electric infrastructure. Growing focus toward adoption of clean energy technologies with an aim to achieve renewable energy targets will positively influence the industry growth. Standard variable frequency drive market is set to grow significantly owing to the introduction of stringent government directives to promote clean energy technology along with the adoption of energy efficient systems. In 2014, European Union introduced the directive 2003/87/EC to reduce carbon footprints by 20% by 2020. Regenerative variable speed drive market will witness growth over 4% owing to its effective energy recovery across high-duty-cycle applications. Low cost, limited maintenance and high-power factor make its adoption preferable over other counterparts. Pump holds the dominant share and will continue to witness growth on account of its deployment across turbines to generate electricity. Growing adoption of flow control devices across water infrastructure will stimulate the product penetration. In 2016, capital expenditure on water infrastructure in China surpassed USD 30 billion. Rising disposable income coupled with improvement in standard of living will positively impact the HVAC industry growth. High end technology adoption by HVAC system manufacturers to comply with energy efficiency standards will boost the variable speed drive market size. In 2016, air conditioner shipments across the U.S. witnessed expansion in growth by 9% when compared to 2015. Rising disposable income along with introduction of innovative technologies will complement the automotive variable frequency drive market. Rapid expansion by OEMs across developing nation will further stimulate the product demand. The automotive industry in India witnessed FDI inflow of USD 5.5 billion from 2014 to 2016. Increasing adoption of high-end technology by oil field service companies to explore the untapped regions will positively impact the variable frequency drive market growth. As per the North American Industry Classification System, in 2016, the revenue generation across oil field services industry has surpassed USD 125 billion. The U.S. variable speed drive market is predicted to witness rapid growth owing to positive outlook toward industries including chemical and cement. Paradigm shift toward the adoption of speed drives for centrifugal and reciprocating equipment will fuel the industry growth. In 2016, as per the American Chemistry Council, the revenue generation from chemical industry had reached USD 164 billion. In 2016, China accounted for over 25% of the Asia Pacific variable frequency drive market share. Rising investments toward the establishment of manufacturing facilities along with increasing operations primarily across oil & gas and power generation industry will stimulate the product demand.in 2016, natural gas production across the country is increased by 2.3 bcm surpassing the overall production of 138 bcm annually. Key industry giants in the variable frequency drive market includes ABB, American Electric Technologies, Crompton Greaves, Amtech Electronics, Danfoss, Emerson, Eaton, Fuji Electric, Hiconics Drive Technology, GE, Hitachi, Honeywell, KB Electronics, Johnson Controls, Mitsubishi Electric, Schneider Electric, Siemens, Rockwell Automation, Toshiba, Vacon and Yaskawa Electric. Major players across industry are focusing on new product developments and M&A’s to gain competitive advantage. VFD are the solid-state regulators that are used in electric motors. Most speed drives are installed on AC electric motors across the industrial establishments. These systems are also applicable to some DC electric motors, but most manufacturers prefer AC motors as DC motors are costly and often subjected to fail.